I’m going to take you on a journey through all the highlight products I own, from the silly expensive to the most bargain drugstore in a bid to help you chose the best highlighter product for you. 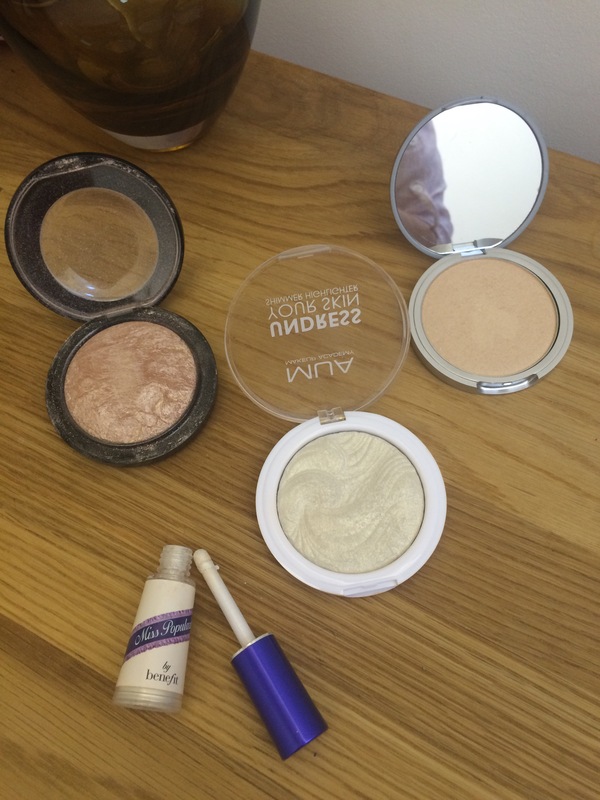 Highlighter is very helpful for brightening the face, particularly if you have had a long night. My baby woke me up at 3.30am this morning, so today I practically used a trowel to apply it. It’s meant to draw attention away from flaws, this I need. I talked about highlighter recently in a tutorial on how to keep it subtle (Check it out). It’s easy to get it wrong- you can look oily if it’s in the wrong place, or robotic if you apply too much. I put too much in my Cupid’s bow the other day, it looked like my nose was running. You also need to chose the right one- think about formulation, colour, amount of shimmer and texture. I’m so keen on the idea of highlighters, I’ve bought loads of them. For this post I thought I would talk you through my collection and tell you where I went wrong, it’ll give you ideas if you’re looking for a highlight product for yourself. There’s a couple of Benefit products that have been discontinued. Don’t worry, you didn’t miss anything, I’ve just put them in to tell you what’s bad about them. 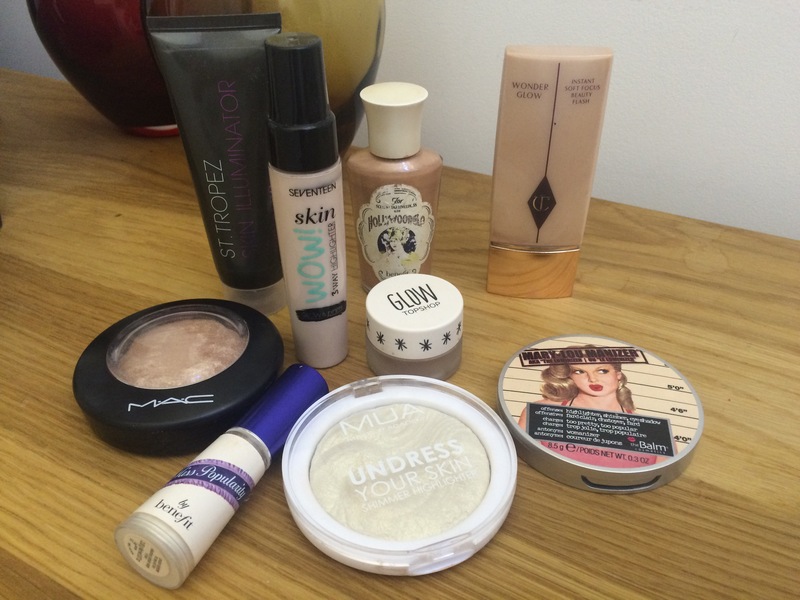 Firstly Liquid Highlighter Products, here’s my selection- Liquid Illuminators are maybe more tricky to apply. But you can wear them as a primer or mix with foundation to add a glow, that’s easy enough. 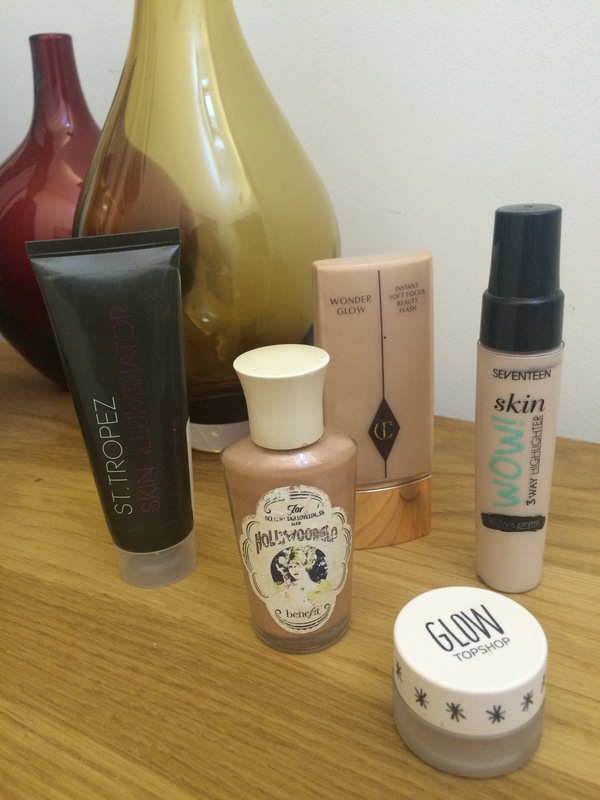 St Tropez Skin Illuminator in Rose ££– This is a pearlescent pink liquid in a mid price range, it’s pretty and subtle. Good for pale skin. Seventeen Skin Wow £- A budget silvery shimmer. I’ve reviewed this before if you fancy a Look. Good for pale girls only. Anyone with dark skin would come up washed out wearing a white highlight like this. Charlotte Tilbury WonderGlow £££–This is the most pricey product on the list at £38.50. Read my Post about it. The official blurb is impressive, it’s powered by a breakthrough Fluorescent Core Light Diffuser, for Pete’s sake! It gives a lovely gentle golden glow that would suit all complexions and works great as a primer or to brighten foundation. Benefit Hollywood Glo– This has been discontinued. I really didn’t like it. It’s a sort of thin bronze liquid. I don’t know what I was thinking, it’s way too dark. It made me look like I had a dirty face. 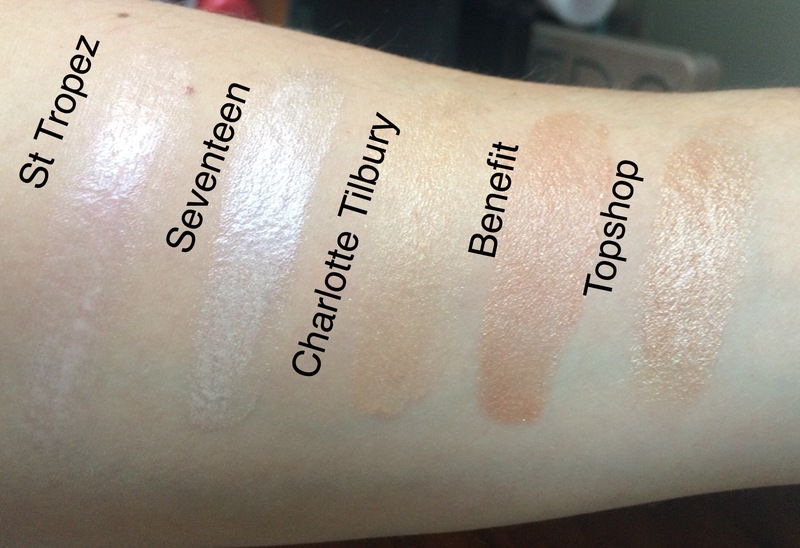 Topshop Glow ££– Glow is a pot of dark gold cream. It has a thicker texture than the liquid so requires a bit more blending. It’s too dark for my cheekbones but works well for the inner corners of the eyes. Powder highlighter goes on top of foundation. They are much easier to apply, just dust on with a brush over cheeks. A natural fibre blusher brush is ideal. You can also use it a bit like eyeshadow to light up the brow bone and inner corners of the eyes. MUA Undress Your Skin in Iridescent Gold £– This is a pale gold powder suitable for paler skin. It doesn’t have the finest texture, it feels quite hard in the pan. But for £3 it’s a great buy, not overly glittery. 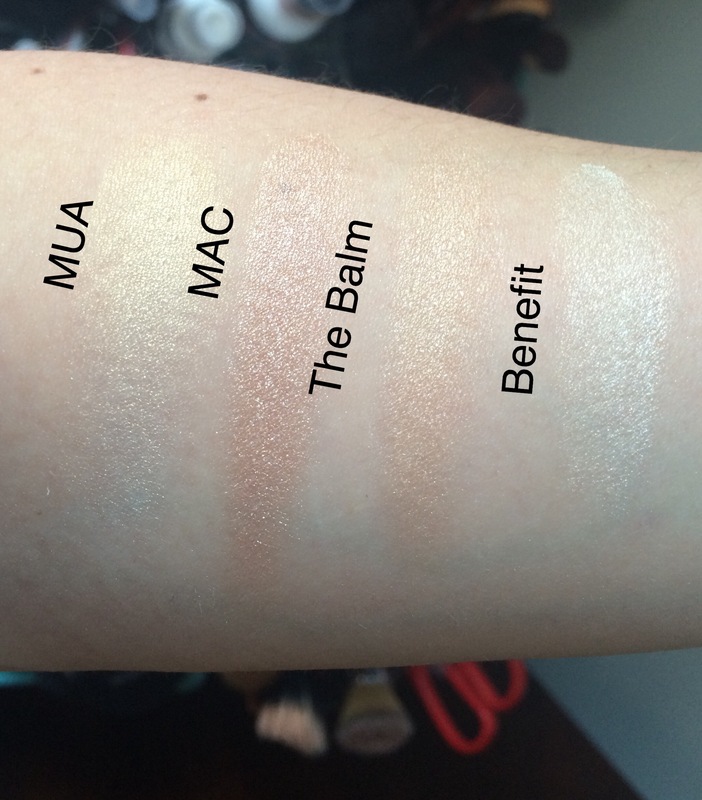 MAC Mineralise Skinfinish in Soft and Gentle £££– This is described as a gilded peach bronze. It’s a lovely soft shimmering powder and despite being the second most expensive highlighter I own, you get so much product for your money it could last you years. It’s possibly a bit dark for me though. Mary-Lou-maniser by The Balm ££– This is the beauty world’s favourite highlighter and I can see why. It’s a butter soft light gold powder. It’s such a great shade and not glittery at all. It costs £17.49 and I agree with the hype, it’s worth it. Benefit Miss Popularly– Also discontinued, but I’m not sad. This was a white shimmer powder in a pot with a sponge applicator. How it was supposed to work I don’t know, I couldn’t get my head round it. When choosing a highlight, think of your skin tone first and then your budget. The more expensive products do have a nicer finish, I have to be honest, less glitter and more opalescence. And I hate to jump on the beauty blogger band wagon but Mary-Lou-Maniser is so buttery and the colour very flattering. Tell me about your favourite highlighter in the comment section below X. Previous Post My Second Liebster Award Nomination!